Cutting edge length: 2.10 in. Blade thickness (near bolster): 0.19 in. Blade thickness (at midpoint): 0.17 in. 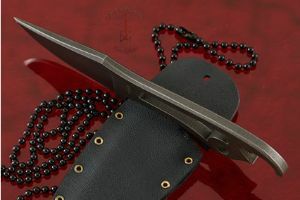 Description: Daniel Winkler became a fulltime knifemaker in 1988 and received accreditation as an American Bladesmith Society master bladesmith in 1993. He has spent more than three decades studying and perfecting the nuances and handmade knives. 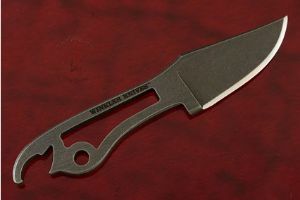 Winkler Knives is a custom manufacturing operation that represents the evolution of Mastersmith Daniel Winkler’s knifemaking expertise coupled with the needs and field experience of Tier 1 Special Operations Teams from around the world. 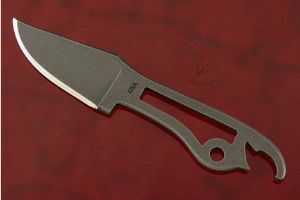 This tool was crafter in the Winkler Knives shop in Northwestern North Carolina by skilled Blue Ridge Mountain artisans. It was created to provide unfailing performance and to last a lifetime. 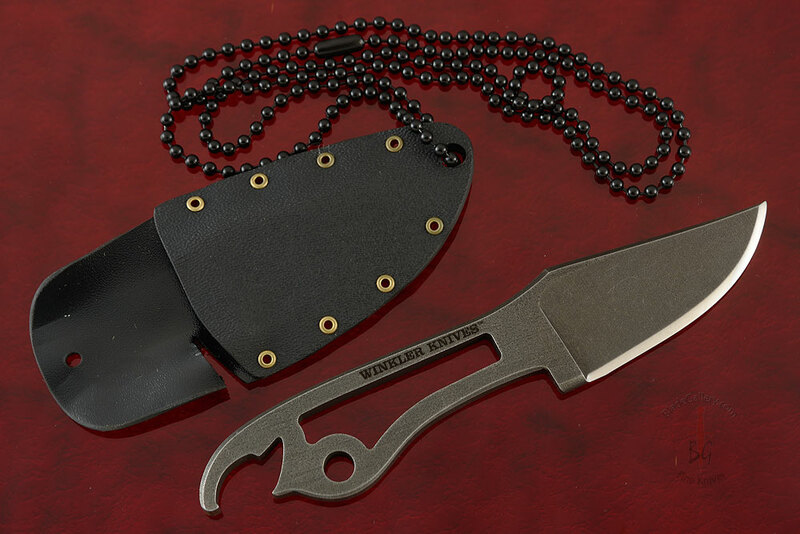 The Winkler Knives touch mark represents their unwavering commitment to producing the highest quality knives, axes, and breaching tools available. Based on the tremendously popular WKII Neck Knife, the Bottle Opener Neck Knife fulfills a need for an easily concealable working backup knife with an additional bonus. The 80CRV2 carbon steel blade has a tumbled black oxide finish and has plenty of cutting edge for maximum efficiency. Daniel's been testing a lot of steels and he reports that 80CRV2 is the best performing steel he's tried in 25+ years of knifemaking! The easily recognizable profile of the handle ensures a confident transition to this knife from your Winkler II large blade. Adding a bottle opener to the end of the handle adds yet another practical purpose. The Kydex sheath is built for maximum versatility. The sheath is designed to be worn with a chain carry. It can be worn around the neck or as a dangle sheath attached to a belt or loop. To remove the knife, depress the finger retainer as you draw the knife from the sheath. When you replace the knife in the sheath, the retainer will click into place holding the knife securely in the sheath. Whether you find yourself in vast wilderness or the concrete jungle, this handy neck knife is always ready to lend a helping hand when no other is forthcoming. 0.046875 0.03173828125 46.875 31.73828125 Header Started. 0.14013671875 0.0458984375 140.13671875 45.8984375 Trailer Started. 0.23388671875 0.09375 233.88671875 93.75 Trailer Completed.